The Vickers Mark E Type B (or Vickers 6-ton) was a huge export success, being sold to various nations across the world in the 1930s. With Japan occupying large parts of China (notably Taiwan and Manchuria) and German advisors suggesting that they should buy European weapons, the Chinese Nationalists (Kuomintang / Guomindang – KMT / GMD for shorthand) began to procure weapons from abroad. 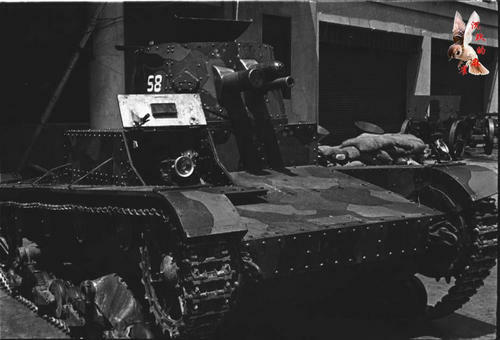 The British company, Vickers, was one of a few sources of Chinese AFVs (Armored Fighting Vehicles) in the early 1930s, supplying 60 light tanks of three different types to the KMT. 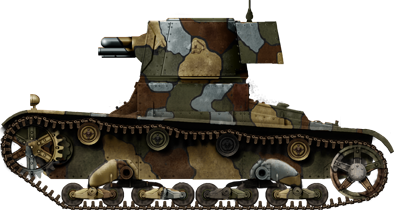 With its low velocity 47 mm (1.85 in) gun, the Vickers Mark E Type B was China’s most potent tank until they were all destroyed in 1937. Standard Vickers Mark E Type B in Chinese Nationalist service. Date and location unknown – likely before 1937. Given that a war with Japan was almost inevitable and the Chinese Communist Party was still on the loose, the Nationalists began a major military modernization campaign in the 1930s. One particular problem that China faced was its lack of AFVs. 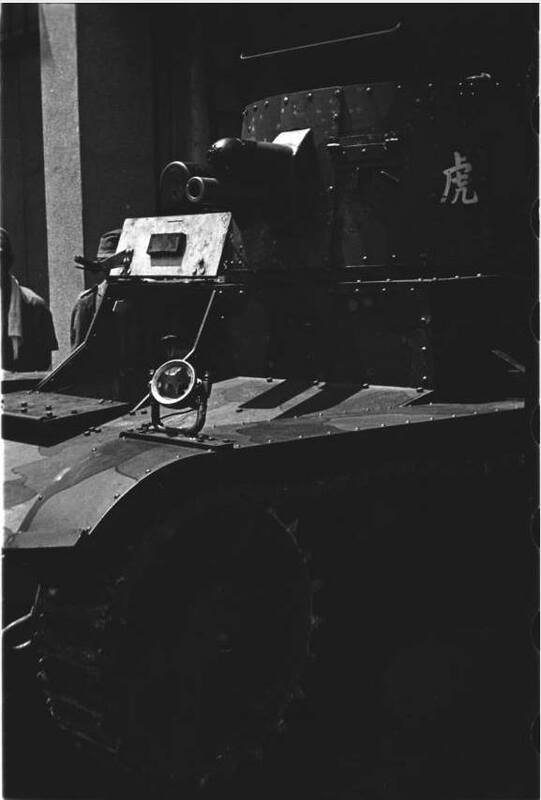 Provincial governments had some improvised AFVs (some also had a handful imported from abroad), but the Nationalist Army only had some Renault FTs bought during the Northern Expedition from France, and some captured from the independent warlord, Zhang Zuolin, or perhaps, were inherited from his son, Zhang Xueliang, who secretly swore allegiance to the KMT after Zuolin’s assassination in 1928. The exact circumstances are unclear. Whilst some of these FTs were armed with Manchurian 37 mm (1.46 in) guns which might be able to destroy Japanese light tanks, but not the Type 89 Yi-Go medium tank, as used in the Battle of Shanghai. Essentially, these FTs were outdated compared to Japanese tanks, and they would certainly not be numerous enough (let alone potent enough) to defend against a possible Japanese onslaught. As part of a broader military modernization campaign, the KMT hired German military advisors headed by General von Seekt. These advisors convinced Chiang Kai-shek to buy as many arms as possible from Europe – no doubt, a money-making scheme by the German advisors, as China bought plenty of German-produced equipment including Panzer Is, Sd.Kfz.221s and 222s, field guns and artillery pieces, and even large numbers of the Stalhelm helmet. 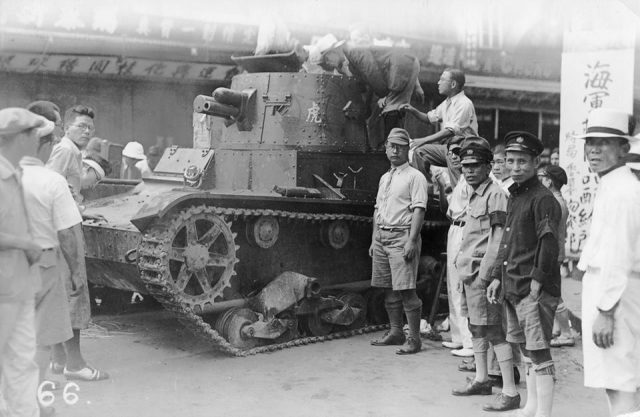 Early 1933: 12 Vickers-Carden-Loyd Light Amphibious Tanks were sold to the Canton (Guangdong) Provincial Government. (Possibly unarmed). These were presumably appropriated by the Nationalist Army, as the total number of tanks fielded by the KMT in Shanghai numbers to about 60, and excluding these 12 VCL Light Amphibious Tanks, the number bought by the KMT is only 48. The figure of 60 also presumably excludes the Vickers Dragon, an armored gun tow tractor which was sold in small numbers (possibly a dozen) to China. Early 1934: 12 Vickers-Carden-Loyd Light Amphibious Tanks, 12 Vickers Mark B Type Es (with 3200 47 mm rounds). Delivered to Nanking/Nanjing between 29th September – 13th November 1934. Mid 1934: 4 Vickers-Carden-Loyd Light Amphibious Tanks, 4 Vickers Mark B Type Es (with 2860 47mm rounds, and plenty of spare parts). Delivered between 11th March – 10th May 1935. Late 1935: 4 Vickers-Carden-Loyd Light Amphibious Tanks, 4 Vickers Mark B Type Es (with 2400 47mm rounds). The Mark B Type Es had extended turrets equipped with Marconi G2A radios. Delivered 21st October 1936. All 20 Mark E Type Bs were assigned to the 1st and 2nd Armored Companies. In total, these Companies had 30 tanks each – the 40 other vehicles were almost certainly the other types sold from Vickers. These companies were assigned to defend Shanghai in 1937 against the Japanese. 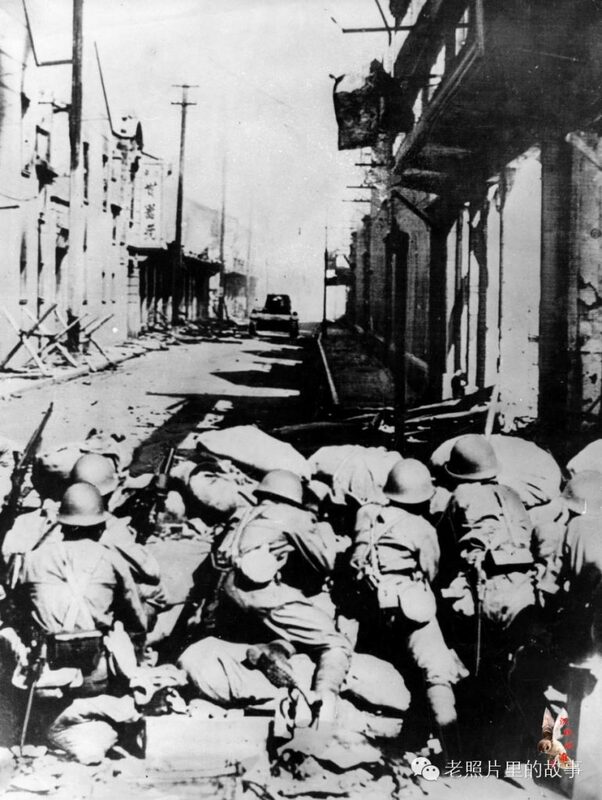 In its most basic terms, the Second-Sino Japanese War’s immediate cause was an escalation of a fairly common local exchange of gunfire between a Chinese garrison and the Japanese garrison in Beiping (Beijing). Chiang Kai-shek was concerned that this was evidence of the Japanese intention for further expansion into China. Chiang began moving his troops from central China up to the north in order to be ready for further Japanese aggression, but the Japanese saw this as a threat, and by late July, both the Japanese and the Chinese were mass-mobilizing for war. In a preemptive strike, Japan sent the elite Kwantung Army (along with local allied armies) into Beiping and Tianjin on July 26th, and both were under Japanese control by the end of the month. Fighting escalated in the Hubei province and the Chinese defense was left to local military commanders such as Song Zhueyan. After various meetings within the Kuomintang, Chiang decided to defend against the Japanese invasion in Shanghai. Chiang used his best troops to defend the city – the 87th and 88th Divisions, which were trained by the German advisors. An estimated 200,000 Chinese soldiers from across China poured into the city and took up defensive positions, including all of the British tanks that China had imported. In early August, the Japanese began landing in Shanghai from the Cruiser Izumo. The Nationalists attempted to destroy the Izumo through a daring aerial attack on 14th August, but this alerted the Japanese to the importance of Shanghai to the Nationalists. 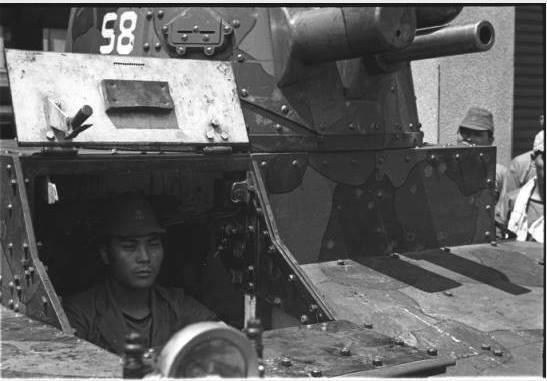 Japan began to deploy large numbers of troops (around 100,000 troops by early September, just shortly into the battle), including an estimated 300 tanks of various classes (according to photographs, this included many Type 89 Yi-Go tanks). The city was heavily bombed by the Japanese air force, in order to soften up resistance, but early attempts to capture the city by the Japanese caused stalemates along the narrow streets, and both sides began to dig-in. It was at this point that the Chinese began using their Vickers tanks. 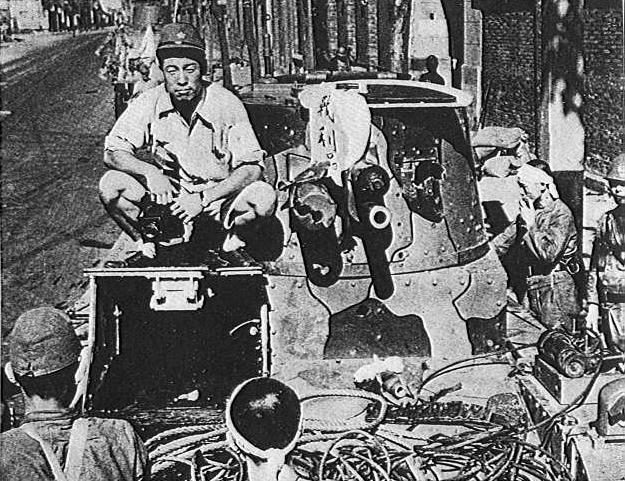 There are few details on the exact combat performance of the Mark E Type Bs, but it seems as though all of the KMT tanks were lost early on in the battle, probably during the First Phase (August 12th – 22nd) in urban fighting, as evidenced by photographs. The Vickers Mark E Type B’s gun was a relatively high caliber one for that time and should have had no issue in dealing with Japanese fortified positions. Japanese SNLF behind a barricade face off against what appears to be a Vickers Mark E Type B. Given the position of the photographer, this is almost certainly a staged propaganda photo. Peter Harmsen reports that two Armored Companies (presumably the 1st and 2nd) were put at disposal of the 87th Infantry Division, and all of the tanks were lost. Despite being Chiang Kai-shek’s elite soldiers, the defenders of Shanghai were inadequately trained. Some of the tanks had only just arrived from Nanjing, and the crews were not trained for coordinated attacks, nor had they been able to establish a rapport with local troops. The two Armored Companies were, therefore, unaided by infantry, which left the tanks vulnerable to enemy AT fire (interestingly, the Japanese had the very same problem). 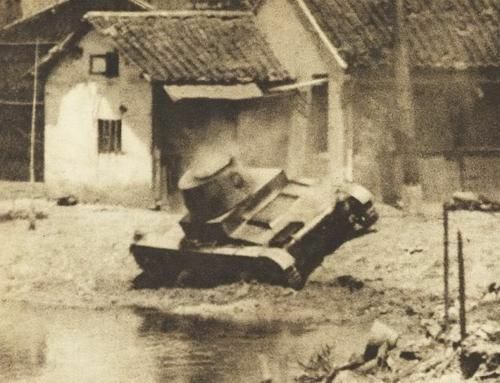 An important point to note is that even with Shanghai’s sometimes narrow streets, all of the Vickers tanks sold to China were fairly small, and would have no issue traversing in Shanghai. However, the streets of Shanghai would be the end of the Vickers tanks. 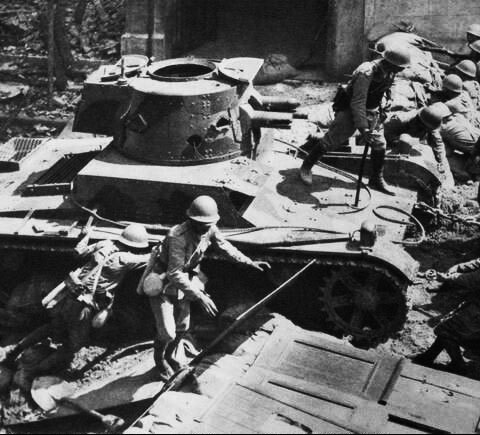 When deploying their tanks, the Chinese neglected to seal off streets adjacent to the tanks, meaning that the Japanese could flank and destroy them. Photographic evidence indicates that the vehicles were knocked out by Japanese AT guns or tanks, which could punch straight through the Mark E Type B’s turret. With only a mere 25.4 mm (1 inch) of riveted armor, it is no surprise that they were no match for the IJA (Imperial Japanese Army). However, this is not the full story. Harmsen reports an incident on August 20th, 1937, on the Yangshupu front. General Zhang Zhizhong was inspecting an unknown number of tanks and got talking to a young tank officer. The officer complained that enemy fire was too fierce, and that infantry could not keep up with the tanks. Shortly after this discussion, the tanks started an assault, but they were all wiped out by shells fired mostly from the Japanese vessels anchored on the Huangpu River. The rest of the Vickers tanks at Shanghai, armed only with machine guns, appear to have suffered a similar fate. After the battle had ended, at least one (but possibly more) Vickers Mark E Type B was recovered by Japan. 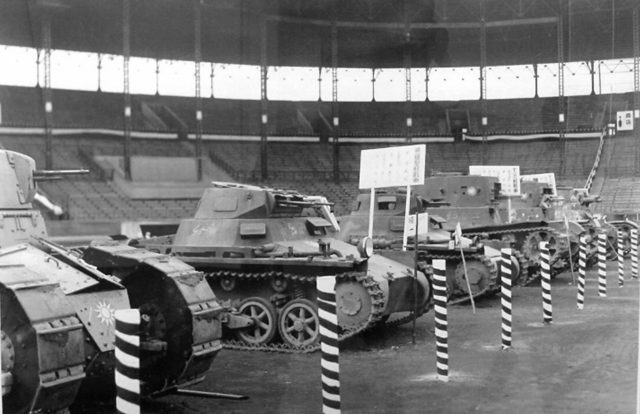 According to photographic evidence, it was put on display at Hanshin Koshien Stadium in Nishinomiya, Japan, February 1939, along with various other KMT tanks, including two Panzer Is (armed with Soviet DT or DP machine guns), two T-26s (with their guns removed) and a Renault FT armed with a machine gun. The Panzer Is were likely captured in Nanjing (where the majority of German and Italians supplied AFVs were fielded and lost). According to one source, a photograph may show several Vickers Mark E Type B in PLA service, as training vehicles in north China in Xuzhou, 1949. 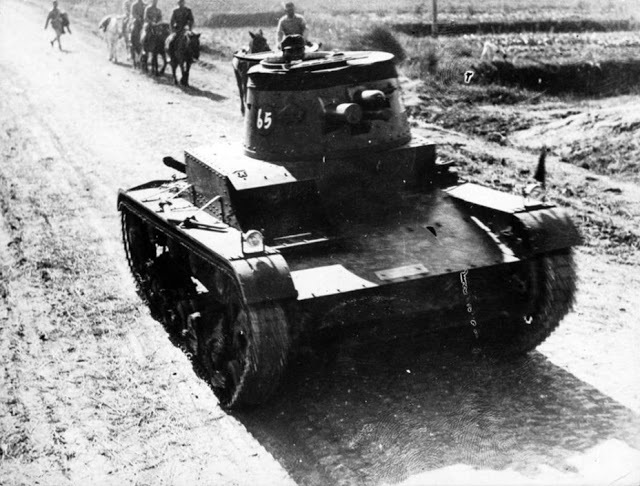 There may be as many as 14 that were captured during the Civil War, but evidence of use of Vickers Mark E Type Bs by the KMT after the Battle of Shanghai (1937) is lacking. If the source is to be believed in its claim (a claim which they note as speculative), then the vehicles may have simply been captured by the PLA from the Japanese, who presumably kept the vehicles in storage. However, Dr. Martin Andrew notes that the uniforms in the photograph appear to be pre-war, the Vickers tanks were destroyed at Shanghai, and there were plenty of other tanks that could have been used for training by that time, such as Stuarts. Chinese Vickers Mark E Type B, Shanghai, 1937. Chinese Vickers Mark E Type B with Marconi G2A radio, Shanghai, 1937. Vickers Mark E Type B, presumably being inspected by locals in Shanghai, 1937. 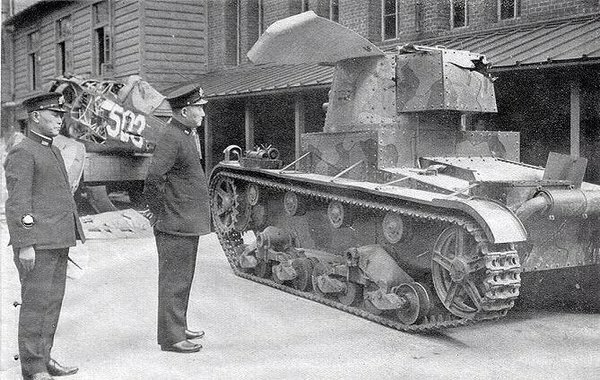 One of the four Chinese Vickers Mark B Type Es with an extended turret – this was in order to fit the radio. Japanese soldiers are inspecting the vehicle, which appears to have sustained light damage. It is unclear whether the crew escaped. Battle of Shanghai, 1937. Knocked out Vickers Mark B Type E with an extended turret being inspected by Japanese officers. The damage to the rear of the turret is an exit hole from a shell fired by a Japanese tank or AT gun. It seems likely that the shell punched straight through the front of the tank’s turret. Battle of Shanghai, 1937. Standard Mark E Type B, apparently knocked out. Battle of Shanghai, 1937. Vickers Mark E Type B, Battle of Shanghai, 1937. Different view of the above. A Nationalist Renault FT, two Panzer Is (armed with Soviet machine guns), two T-26s (missing their armaments and mantlets), and just in shot, a Vickers Mark E Type B on display in Hanshin Koshien Stadium in Nishinomiya, Japan, February 1939. A Japanese soldier poses on a Vickers Mark E Type B with his flag. It appears as though the vehicle had sustained a small penetration in the middle of the hull, as well as an AT gun hit on the coaxial machine gun, and another on the right of the main gun. Correspondence with Dr. Martin Andrew regarding Chinese AFVs. He had checked Vickers factory archives and had compiled a list of Vickers arms sales to China. I was wondering if there are numbers available on the penetration of the AP round for the low-velocity 47mm Vickers gun? Thanks for the great site, and thanks for your time.